the day was passing and drawing to early evening and jean grey was shopping in town fo rthe last of her xmas shopping. as she roamed around the mall complex she could not only hear the thoughts of the populace as they passed by her on their merry way but she could sense their emotions as well. Jean frowned and rubbed the side of her head. *man how i hate to be out & this close to people. * She thought to herself as she continued on her way. Being out and this close among so many people made things very hard & difficult for jean to shut out the strong ramdom thoughts & feelings that intruded apon her psyche and left her feeling tired and in pain at the constant consentration that she had to do just to block them all out of her head. after buying the last of & collecting the rest of her gifts jean headed for the car parkk to unload them into the back of her car. This done and tired as she was jean went into the nearest cafe not too far from where she was parked & ordered herself some coffee and sandwiches and hoped that just this once there wouldnt be any trouble with either the human population or the mutant population that would cause her to get involved. Cause in her present comdition with the painful headache she had she felt that she just might lose control of her temper and her powers and jean knew that that would be a very bad thing to happen. 'Scott was so happy when they found me......Who am i well my name i Jean Elizabeth Grey... I am the real Jean, the one the Phoenix left beneath the still waters of alkali lake. After all that had hapened with the phoenix during its time here in the world and all that followed the friends and family that are lost to us all......I looked over at Scott's sleeping form lying there next to me and couldn't believe it. In just a few weeks i would be marrying the man i've loved since the day i first met him here at Xavier's School for the gifted...... It seemed like yesterday when all of us who lived here within the walls of the mansion dreamed about their future, and how it would be. Of course no one thought that i would die, come back as the Phoenix, and die again, only to return to once more.'...... I sighed as i read through what i'd just finished writing here in my diary and as the unshed tears filled my eyes i put my diary back into the drawer and got out of bed.Walking into the bathroom i turned on the shower and stepped into it only then allowing my painfilled tears fall silently.Tilting my head to the i knew the instant that everyone throughout the school was waking up and getting ready for the day to begin. Leaving the bathroom i dressed and put on a brave face for all to see as the new day began. Jean was an attractive woman, the kind that could stop a man in the street just to watch her walk by. But if anyone saw her today they would most likely avoid her at all costs. Being a natural redhead she had a temper to match one that usually simmered just below the surface unfortunately for everyone today that temper had shown itself. Not one thing had gone right that morning vital paperwork had gone missing and vital information though backed up onto disk for safe keeping had been lost when the medlab computer had crashed. slamming the door from her office in a temper she went to teach her shceduled class only to find in house argueing and fighting among the students. ENOUGH! was enough when she saw the mess of the classroom and the fighting going on and it made her temper snap. Gone was the easy going tutor that everyone liked and in her place was the phoenix. Though the bird effect didnt show the power rolling throughout the room and the firey glowing of her body hair and eyes sent the studants into a fearful panic and had them backed against the classroom wall. Using her powers she opened the door. 'GET OUT!' she said to the children so they wouldnt get hurt as she fought for control. The children ran and jean herself left the building before she lost it completely. The flames around her vanished but her eyes remained a firey gold which she hid behind dark glasses and headed for town and god help anyone follish enough to cross her that day. She feared what she would do as she tried to reign in her temper. The professor was in washington and scott and some of the team were on a mission, so that left jean alone to wander through the city. Somewhere unknown, a young readhaired woman with golden sun taned skin sat on the floor in the meditating position with her eyes closed, surrounded by silence of the room that she resided in. She gasped as her eyes popped open revealing green eyes that were filled with annoyance. jean lost the consentration that she had had going to the sound of the students of the xavier institue running up and down the hallways of the mansion going to and fro to their next classes.Giving up meditating here within the house jean got to her feet and went outside into the garden and headed for her favourite spot away from everyone. It was mid afternoon and the day was warm as she returned to her meditation.soon random thoughts and feelings begun to intrude upon jeans mind and though they were a great distance away from her current location they were loud and persistant.jean narrowed her eyes in anger the one emotion that she really wanted to control least the dark phoenix side of her personality return to the fore. Jean awoke early, it was just before dawn that morning. Sighing she got up and went to the dresser and picked out the clothes she wanted to wear that day before heading to the shower. For the past week and a half she'd woken this early for no other reason than that she could'nt sleep which was unusual for her because she was so used to have a full night's rest. After showering she got dressed and made her way downstairs to the kitchen to begin making coffee. Switching on the percolator Jean sat down at the kitchen table to wait. When the coffee was ready jean picked up her cup and poured herself one and then returned the pot back to the cradle and turned back towards the table and saw professor x coming through the door. 'Good morning professor, coffee's just made can i get you one?' She enquired as she placed her cup on the table and made to retrieve another. Jean woke in the darkness to a hunger, one that she'd only felt once before. She turned and put on the bedside lamp and wondered what the hell she should do. The phoenix insistant voice was wringing in her ears and she tried her damnedest not to listen tot he voice within. Getting quietly up from the bed she made her way towards the kitchen as she fought to keep her other side at bay and by the time she reached the kitchen she had a struggle on her hands and one she knew she's failed miserably THE DARK PHOENIX side of her personallity was loose. IT HUNGERED and wanted sustenance and it didnt care where it got it from as long as it did. The firebird rose fast above the earth's surface and scanned throughout the universe for what she needed, finding 3 dying stars she entered the solar systems and ate each sun before returning to earth and her room. The hunger was contained for now but Jean knew it wouldn't last for long. This silence of the night was astounding, you could hear for miles around if you were a mutant and a telepath like like myself. The evening brought to my mind the sound's and thought's of the local population that were going about their early evening business to the sound's of the clubber's moving around the streets. Who am I? My name is Jean Grey and right now i sit here quietly upon the wall of the mansion that is my home. 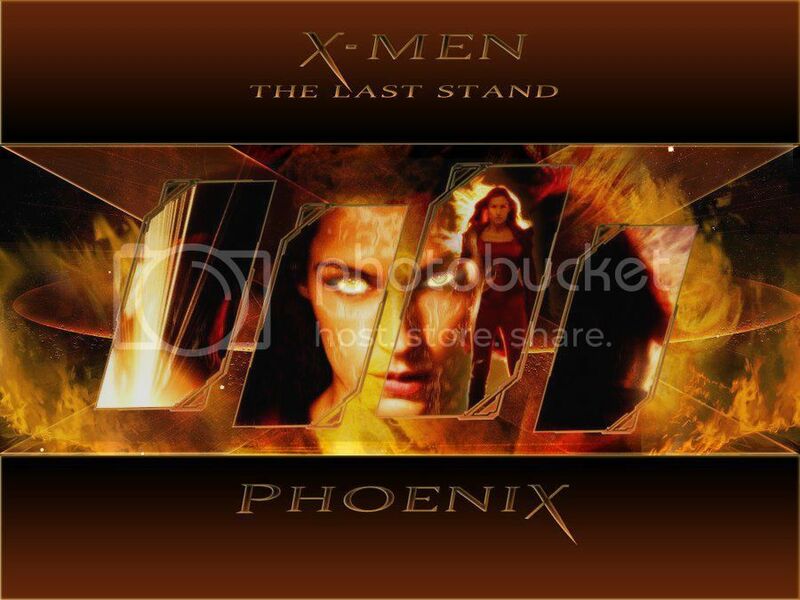 To most people that know me i am known as PHOENIX but i am a dr of medicine, science and genetics and like the professor i am world reknown for my knowlege pretaining to the mutant population of the world. Smiling silently to herself Jean moved from the wall and hovered in midair using her telekinetic abilities rather than that of the firebird inside of her body as she felt that that woud just be showing off and that is something that she would never do just for fun unlike some of her other friend's that she had who likes to use the natural gifts for just that purpose or for the hurting of other's. Though she had total control of all of her powers Jean felt that she still had a lot of work and a long way to go before she felt that she had thats same control over the phoenix inside as she had with her other powers. So landing she walked intot he mansion and went into the dangerroom releasing all safeguard protocalls and set to work of training herself to do just that. Within the room the firebird that represented the force shone evervesent and brightly as she hovered their silently within its confines. *Why me she thought to herself, why did she answer me on that fateful day? * These were just some of the question's that circled the walls of Jean's mind, question's that she Jean knew would never be answered. As she pondered this she suddenly became aware that she was no longer alone within the dangerroom someone was in the controlroom watching her. Raising her head she turned golden firey eyes in that direction. Jean was tired, the hours she'd spent within the dangerroom had left her ehausted. Upon exiting the room she headed for the lockerroom and hit the showers to work out the kinks with the heat from the water. As she stood beneath the torrents of water Jean could sense the strong emotions from everyone within the building. Sighing she switched off the water and exited the showerroom and entered the locker room to get dressed. she walked slowly through the hallways of the mansion rubbing her head at the beginings of a headache caused by the barrage of emotions she was trying her hardest to keep locked out of her head. Reaching the bottom of the stairwell Jean couldnt stand it anymore, so sitting down on the stairs she put her head in her hands as she tried to keep control but things around her begun to shake and hover in the air around her. Her emerald green eyes opened in the hour just before the dawn when the sun was just comming up over the horizon. Unable to sleeep any longer she rose silently from her bed and went into the bathroom to shower and dress for the comming day ahead. Using her gift she turned on the shower while looking through her closet and chest of drawers for the clothes she wanted to wear that morning. Underware, white shirt and black slacks with her flat pump shoes, this done she placed them apon her bed and entered the bathroom. Jean smiled to herself as she knew she was the only person within the school that was awake as of yet and for once she had some semblence of silence within her head, but knew it wouldn't be long before she would feel the others wake. Shower done she quickly dried herself and returned to her room and dressed in the clothes she'd left apon the bed just as the first rays of the morning sun came through her bedromm window and lit up the room. Stepping from her room she walked down the stairs to the main floor and headed for the kitchen. As she filled and switched on the kettle she felt the first stirring of life as people begun to wake. sighing softly she closed her eyes for a few seconds then gave herself a mental shake. Just then the kettle clicked off telling her it was ready for use as the sounds of foot falls could be heard comming down the stairs to the main section of the mansion..